Performance by Bernadette Balkus, Claire Edwardes from the CD Music of the spirit. Double resonances / music by Bruce Crossman. Instrumentation: Piano, percussion (1 player: kulintang, crotales, vibraphone, bass drum, Korean temple gong, suspended cymbal, Peking Opera gong, 2 roto-toms [low, middle], ching [suspended], 3 bongos [low, middle, high], K'kwaenggwari). 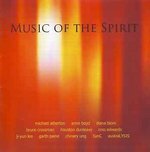 Book: Music of the spirit : Asian-Pacific musical identity / edited by Michael Atherton and Bruce Crossman. 22 Aug 2009: at Melbourne Composers’ League (Conservatorium Recital Hall (Hobart)). Featuring Michael Kieran Harvey, Peter Neville. 21 Aug 2009: at Melbourne Composers’ League (Iwaki Auditorium). Featuring Michael Kieran Harvey, Peter Neville. 19 Apr 08: Aurora Festival, Sydney. Featuring Bernadette Balkus, Claire Edwardes.